Here is a long-standing fascination in embryology. When we think about how many uncertainties a growing embryo is facing, it is remarkable that embryos do not grow into unrecognizable monsters. Protein levels are different from cell to cell, environmental parameters fluctuate, genetic variations abound, size and geometry vary. But development of embryos relies on a large network of biochemical reactions and molecular transport, both of which are sensitive to variation in concentration, temperature, rate constant, geometry, among many other parameters. 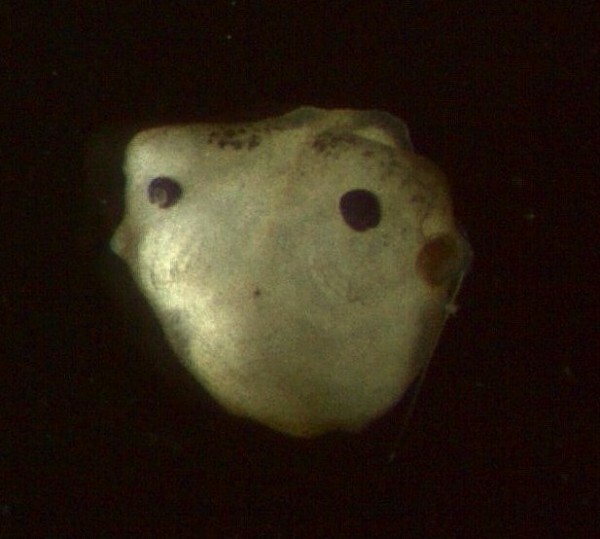 It is easy in the lab to make this tail-less, two-headed frog tadpole. How do embryos manage to develop normally? Photograph by A. Baetica. The fine-tuned-ness of the underlying physical and chemical processes, and the robustness of the overall system, suggest that buffering comes from the way the processes are designed and connected to one another. We have now deciphered the mechanism of buffering at the level of the working of an enzyme (e.g., see Shinar et al., 2009), biochemical circuits (e.g., see Barkai and Leibler, 1997, Alon et al., 1999), signaling pathways (e.g., see Batchelor and Goulian, 2002, Goentoro and Kirschner, 2009), and molecular networks (e.g., see von Dassow et al., 2000, Eldar et al., 2002, Ben-Tsvi et al., 2008). In the lab we ask, how do we integrate what we know about robustness at the molecular level and truly make sense of the remarkable robustness at the organismal level?